"I just happened to catch this little bit at the bottom," says Brian Gerrish on UK Column News: "This is what it said: `Europe is now the hub for child abuse content` and I was fascinated that the story which is essentially about the abuse of children is now pushed sideways into the category of technology. It`s nothing to do with children being abused, it`s simply to do with what is circulating on the internet and we should be concentrating on what`s circulating as if the content is not actually child abuse. It`s a fascinating piece of spin and propaganda by the BBC and I found it deeply offensive particularly as this is going on in the background." 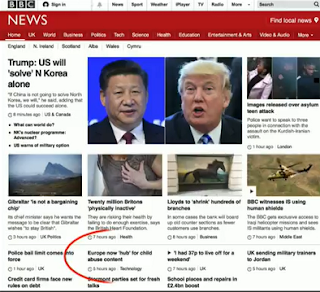 "Now just a reminder here that we`ve had a lot in the news that Google and Facebook and other social media providers are going to tackle terrorists and extremists online. So we`ve just chosen the Telegraph article here but what they`re saying is: `Google and some of the world`s biggest internet companies agreed last night to create new technical tools to identify and remove terrorist propaganda in the wake of the Westminster terrorist attacks`." "So this is all Google doing good work to protect the public and the Guardian here: `Amber Rudd showdown talks with tech firms on extremism are pure PR`.Well the Guardian is being a bit more cynical. It`s saying that `meetings between UK government and Facebook are more ritual than battle as they avoid subjects that both parties disagree on`... tax is obviously an important thing - more important than cleaning up the internet." 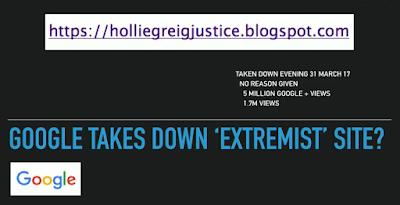 "Well, we were informed over the weekend of this, and the information is that the holliegreigjustice.blogspot has been taken down by Google. It was taken down on the evening of 31 March 2017. Apparently, no reason has been given and the site itself has had 1.7 million ordinary views and 5 million google + views." 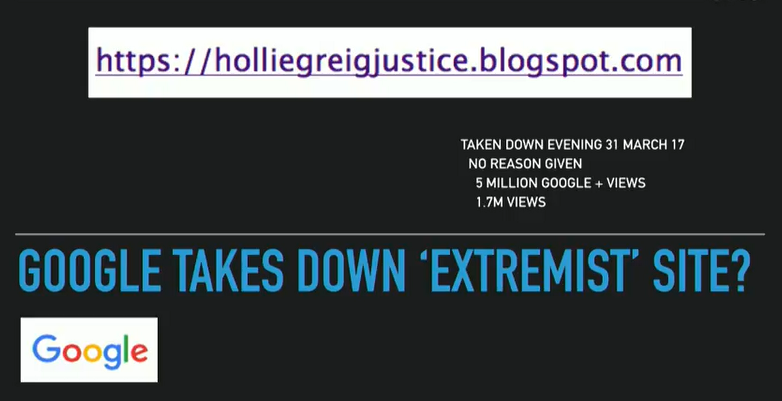 "So what is the holliegreigjustice site about? Well, of course, it`s about justice for Hollie Greig and in striving for justice for Hollie, striving for justice for all other survivors of child sexual abuse. So we find it interesting that Google has suddenly turned its attention to this website... Remember that the focus of this is on Hollie on the left hand side and the mother Anne and of course Robert Green who`s been to prison twice trying to achieve justice for Hollie. So we wondered why Google would suddenly get tough on child abuse extremists." "Well the good news is that there is a replacement site up at the moment but it`s very thin on the ground and I know that the people working behind the scenes are desperately trying to get ... the content they had previously up, but this is causing them some problems." "Now one of the questions that`s been raised - it`s speculation but I think it`s very interesting speculation - is what would have caused Google to take this action? And our attention is turned to these letters which Robert Green`s MP David Mowat has actually been sending out. There`s three of them, and this gentleman has stood up to be counted on behalf of Robert and let`s have a look at what these letters say." "So basically, the first one is to the Permanent Secretary of the Scottish government and it says: `Mr Green my constituent recently came to see me to discuss a number of issues and during the discussions he made reference to the fact he had requested copies of correspondence from your office and that not only had this been denied but that no satisfactory explanation had been provided as to why his request had been declined`." "And then the letter says well `I am therefore asking you, if you will tell me why the material has been denied and why you have made this decision`. Now for an MP to do this, that`s a lot of weight behind Robert Green`s original request..."
"So we`ve got another letter here. It says that `I understand that the aforementioned constituent has been in recent communication with your office in order to secure the transcript of a case in which he himself was involved. I understand that Mr Green has subsequently been provided with a transcript as per his request. However, Mr Green has advised that the transcript is incomplete and that a section of the proceedings which he feels particularly significant to his case has been excluded from the text and so Mr Green is asking for that to be provided - and they are being asked why this has been excluded." 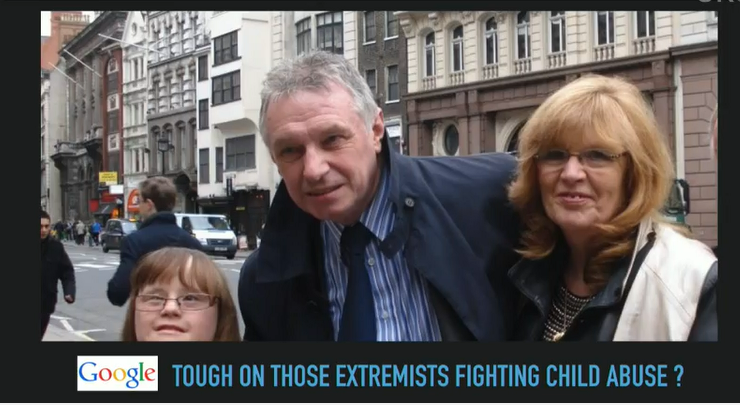 "This is the key tape from one of the court cases that Robert Green went through. So the Procurator Fiscal in Scotland is now being asked to provide the tape which Robert Green has been attempting to get and we say again this is really marvellous to see an MP standing up to be counted and now asking himself." "Right well ... let`s just bring this up... well this is a question being asked on the website that basically on the 4th December 2009, Google got a letter from the Scottish government legal representatives threatening to take down the site. That was overcome but what the website supporters are saying is that in 2017 they may have done the same thing again." "So the inference is that the letters that have been sent to the Scottish government have been so dangerous that the response has been for the Scottish government to contact Google." "Now there is another letter and this is probably the key one because of course what we`ve got here is Mr Mowat writing to Nicola Sturgeon and what he`s saying is that his constituent Robert Green has come to see him and pointing out that the Scottish child abuse inquiry has now had a number of individuals resigning and surprisingly the Scottish government has simply replaced them with one individual and how can that possibly work? How can you take an investigation which was supposedly going to have a team of people working and then you simply replace it with Lady Smith?" "The aforementioned constituent has been in contact with me over a number of years and keeps me abreast of his endeavours to secure justice for Hollie Greig. I understand that he has written to you on a number of occasions regarding this and related matters. However the purpose of my writing to you today is in respect of the Panel that has been set up for the Scottish Child Abuse Inquiry." "Mr Green recently came to my office to discuss a number of issues and during our conversation he mentioned that of the three persons originally appointed to the Panel: Ms Susan O`Brien QC, Professor Michael Lamb and Mr Glen Houston, all have now stepped down from the inquiry. I understand that the first two cited interference from the Executive as their reason for so doing." "However, my concern is not so much that all three of the panellists have determined not to continue in post; albeit that this is not a particularly helpful state of affairs, my concern relates to the fact that three panellists have all been replaced with a single person; Lady Anne Smith." "Given the important work that this inquiry is required to undertake it does seem rather unorthodox to appoint a single person to take matters forward, when initially it was considered necessary to appoint three people to share the load. Furthermore given that Lady Smith was nominated to post by Mr John Swinney MSP, a member of your Executive Team; does this not open the Executive up to potential challenge? As such it would appear to me to be a risky strategy to pursue." 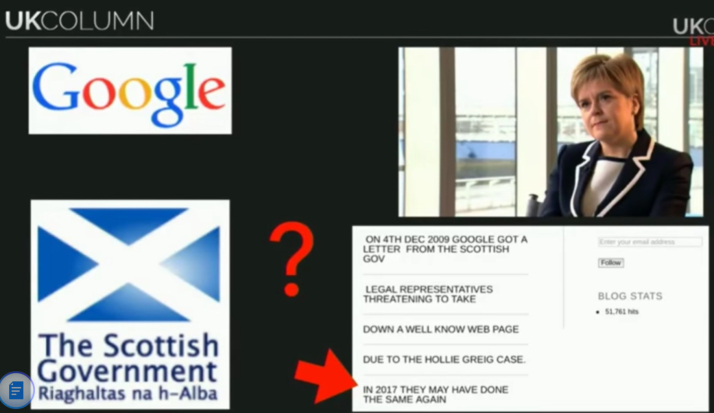 "So the inference is that these letters have upset the Scottish government and particularly Nicola Sturgeon... to such an extent that they`ve called upon Google to take down the whole of the history which of course has been up on that website about the Hollie Greig case. I think there may well be some merit in this because obviously the Scottish government has been prepared to act and attack Robert Green in particular every time he started to make headway with questions about the Hollie Greig case." "Now just for completeness: I spoke to Google media team this morning [3 April 2017] and followed up with this email simply saying `We understand that you`ve taken this website down. Please confirm that. But also is it correct that this `take down` action is at the behest of the Scottish government? So we sent that email off just before we became live. We haven`t had a response yet but it`s going to be extremely interesting to see what Google says." "So Google, publicly tough on terrorists, but behind the scenes the inference seems to be that if you get too close to criminal activity at the government level you`re going to be taken down as well."